The final round of the Tony Evans Winter League took place on the Decoy complex on Sunday with some of the best local anglers on commercial waters lining the banks. On the day John Whincup took the honours from peg 22 on the Oak Pool with a cracking 137lb 6oz. High winds all day made it very difficult indeed to fish the pole so Whincup stayed on the feeder. The consistent Rob Goodson was a close second from Oak 12 with 125lb 15oz followed by Zac Brown with 116lb 6oz from peg four on the Beastie Pool. The overall winner of the league with a fantastic five-point score was Rob Taylor, who proved to be much too consistent over the series for a whole host of quality anglers. Runner-up was Bradley Gibbons with seven points and third was Rob Goodson on eight points. In the latest JVAC match fished on the Cedar Pool at Decoy it was Andy Gausden once again topping the field. He drew quite well on peg two and after a slow start on pellet, he ended the match on a high bagging up on sweetcorn to weigh in 129lb 3oz. Second with 96lb 6oz was Steve Dorks, who caught well on red maggot and cat meat for 96lb 6oz, then came Nick Carlton with 92lb 2oz. In the Decoy Lakes Over 55s match fished on the Beastie Pool it was Roy Whincup leading the way with 100lb 2oz taken on the feeder and short pole with red maggot from peg 20. Second was Mike Mitchell, who had a level 81lb, and third was Paul Parsons on 79lb 10oz. Lou’s Lake at Decoy does not often get the praise it deserves, many feel it’s down to just the noted pegs that produce. However, looking at Sundays Ramsey AS match on it that’s far from the truth. Leading the way from peg 10 was Andrew Wilding. He caught most of his fish on a feeder and pellet approach weighing in 111lb 4oz. Runner-up from peg two was Ken Taylor, who caught on the pole with worm for 99lb 11oz, then came Andrew Kilby with 88lb 10oz from peg 14. A special mention should go to 10 year-old Corey Ellington-Rayment. 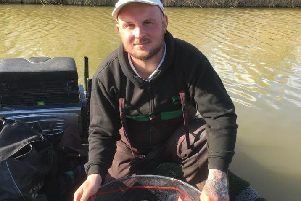 He fished solo for the first time in a match and weighed in 22lb 8oz, beating four adults for equal 10th place. The Wednesday Over 55s match result at Float Fish Farm Fishery makes encouraging reading as it looks as if carp are starting to show in several areas at last. Top rod was Stan Dow, who caught on the pole with meat and sweetcorn over hempseed for 92lb 11oz from peg 23. Second was Phil Jones with 57lb 15oz from peg seven, followed by Gus Gausden with 51lb 6oz. Fishery regular Tony Moulds put a respectable 33lb 5oz to the scales in the latest Haddon Lodge open to take a comfortable victory at the weekend. He fished a straight lead with banded pellet taking carp and a few skimmers. Runner-up was Martin Harwood, who caught on red maggot for 17lb 7oz, and third place went to Lucio Melillo on 12lb 2oz.